Home News players Richard Gadze is roaring in Zira Fk, But is he coming back? 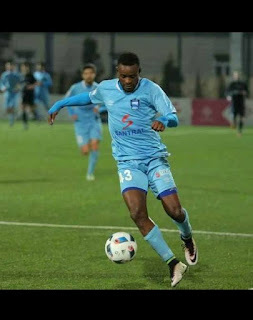 Richard Gadze, the 22 year old Ghanaian, impressed in his stint with the Azerbhaijan Premier League side Zire FK. Richard was a regular started in the league fixtures and the coach trusted him with his preferred center forward position. Gadze saved the Azerbaijani side multiple times by scoring in the crucial moments to earn them valuable points, however it was not enough as Zire FK finished fourth in the league table which meant that they did not qualify for the European Cup qualifying rounds. Richard Gadze made a total of 12 appearances for the club scoring 3 crucial goals. There were a lot of positives in his performance despite hitting post and missing sitters multiple times. The Lion has already extended his stay in Zire FK, which was confirmed by Zire FK's official website, however it fails to mention whether it was on loan or a free transfer making his return to Delhi Dynamos doubtful. Fans can just hope that they see him in the colors of Delhi Dynamos this season, the rest depends on him. Here's a latest clip of his performance.